Believe it or not, people have protested the mass medication of the public through drinking water all along. 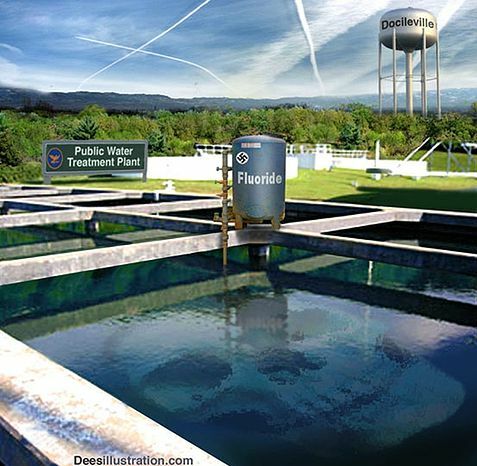 The fluoride in tap water – although touted as healthy and safe – is nothing more than the “legal” unregulated way for chemical companies to unload their waste. And we pay for that privilege. Last year, a highly contested Harvard research study published in The Lancet implied that water fluoridation is not only ineffective for teeth but is a neurotoxin associated with ADHD and other neurodevelopmental issues. It has also been associated with a significant drop in IQ. Fluoride was recently outted as damaging to the thyroid – that is significant when talking about neurodevelopmental problems. Critics can shrug off and jeer the results all they want but something has sparked other research teams to study fluoride’s effects on the brain. Namely – to see if “Is there something in the water? ?” is a valid question that should be answered before it’s too late. Has a fluoridated water supply been responsible for more ADHD diagnoses since the early 1990s? Enter the recently published study in Environmental Health. State prevalence of artificial water fluoridation in 1992 significantly positively predicted state prevalence of ADHD in 2003, 2007 and 2011, even after controlling for socioeconomic status. “The prolonged ingestion of fluoride may cause significant damage to health and particularly to the nervous system,” concludes a review of studies by researchers Valdez-Jimenez, et al. published in Neurologia (June 2011), reports New York State Coalition Opposed to Fluoridation, Inc. Putting fluoride in drinking water is all good, right? Let’s hope so. It’s been all but standard American policy for 50 years. But new research is pushing Uncle Sam to brush up his policy a bit. According to the report from Centers for Disease Control, 2 out of 5 adolescents have tooth streaking or spottiness because of too much fluoride. In some extreme cases, teeth can even be pitted by the mineral — though many cases are so mild only dentists notice it. Young teens seem especially affected.